Cell Death Differ 2014 21(3), 491-502. PIK-75 HCl purchased from Selleck. A549 cells were treated with PIK-75 (100 nM) or SNS-032 (300 nM) for the indicated times. Cells were lysed and subjected to western blotting. One representative of two independent experiments is shown. 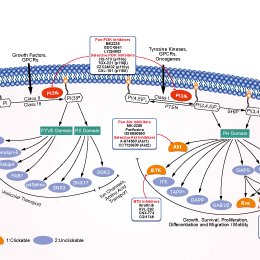 Knockdown of BRCA1 sensitizes cells to PI3K/AKT pathway inhibitors. MCF7 cells transfected with either BRCA1-siRNA or control-siRNA were treated with increasing amounts of inhibitors targeting the PI3K/AKT pathway for 48 h in triplicate. Viable cells were measured by MTT assay. Mol Carcinog 2012 52, 667-75 . PIK-75 HCl purchased from Selleck. DW compounds dose-dependently and persistently blocked the PI3K/mTOR signaling pathway in RH30 cells. DW09849 persistently inhibited PI3K signaling. RH30 cells treated with 0.1 uM DW09849 or PIK-75 were harvested at indicated times (0, 0.25, 0.75, 1.5, 3, 6, 12, and 24 hours). Western blot analyses were conducted to detect the indicated proteins. Data shown are representative of three independent experiments. Con, concentration. J Pharmacol Exp Ther 2014 348(3), 432-41. PIK-75 HCl purchased from Selleck. Theconcentrations ofatumornecrosis factor-α(TNF-α),binterleukin-6(IL-6), and c macrophage inflammatory protein-2 (MIP-2) in lipopolysaccharide(LPS)-activated RAW264.7 cells measured by enzyme-linked immunosorbent assay. LPS: the LPS (100 ng/mL) group. LPS+V: the LPS plus vasopressin (100 pg/mL) group. LPS+V+LY: the LPS plus vasopressin plus nonspecific PI3K inhibitor LY294002 (10μM) group. LPS+V+PIK: the LPS plus vasopressin plus specific PI3Kαinhibitor PIK-75 (50 nM) group.LPS+V+TGX: the LPS plus vasopressin plus specific PI3Kβ inhibitor TGX-221 (50 nM) group. LPS+V+IC: the LPS plus vasopressin plus specific PI3Kδ inhibitor IC-87114 (5 μM) group. LPS+V+AS: the LPS plus vasopressin plus specific PI3Kγ inhibitor AS252424 (300 nM) group. Data were derived from six culture dishes from each group andexpressed as the means±standard errors. *P< 0.05, the LPS+Vgroup versus the LPS group; #P<0.05, versus the LPS+V group. Inflammation, 2017, 40(2):435-441. PIK-75 HCl purchased from Selleck. For MTT assays, cells (2,000 ~ 5,000 cells/well) were subcultured into 96-well plates according to their growth properties. Cell proliferation was assayed at 72 hr after treatment of PIK-75 by adding 20 μl of 5 mg/ml 3-(4,5-Dimethylthiazol-2-yl)-2,5-diphenyltetrazolium bromide (MTT) solution per 100 μl of growth medium. After incubating for 3-4 h at 37°C, the media were removed and 150 µl/well of MTT solvent (either absolute DMSO or isopropanol containing 4 mM HCl and 0.1% Nonidet-40) was added to dissolve the formazan. Dr. Yong-Weon Yi from Georgetown University Medical Center. PIK-75 HCl purchased from Selleck. The PI3K inhibitor PIK-75 is dissolved at 10 mM in dimethyl sulfoxide and stored at −20°C until use. PI3K enzyme activity is determined in 50 μL of 20 mM HEPES, pH 7.5, and 5 mM MgCl2 containing 180 μM phosphatidyl inositol, with the reaction started by the addition of 100 μM ATP (containing 2.5 μCi of [γ-32P]ATP). After a 30-minute incubation at room temperature, the enzyme reaction is stopped by the addition of 50 μL of 1 M HCl. Phospholipids are then extracted with 100 μL of chloroform/methanol [1:1 (v/v)] and 250 μL of 2 M KCl followed by liquid scintillation counting. Inhibitors are diluted in 20% (v/v) dimethyl sulfoxide to generate a concentration versus inhibition of enzyme activity curve, which is then analyzed with the use of Prism version 5.00 for Windows to calculate the IC50. For kinetic analysis, a luminescent assay measuring ATP consumption is used. PI3K enzyme activity is determined in 50 μL of 20 mM HEPES, pH 7.5, and 5 mM MgCl2 with PI and ATP at various concentrations. After a 60-minute incubation at room temperature, the reaction is stopped by the addition of 50 μL of Kinase-Glo followed by a further 15-minute incubation. Luminescence is then read using a Fluostar plate reader. Results are analyzed using Prism. Method: Mitochondrial activity is assessed after stimulation with TGFβ with or without inhibitors for 48 hours using the 3-(4,5-dimethylthiazol-2-yl)-2,5-diphenyltetrazolium (MTT) assay. Harvested washed cells are resuspended in DMEM-lO% FCS and aliquoted (500 μL) into 24-well cluster plates prior to serial dilution (1:2) in duplicates. To each well, 100 μL of an appropriate MTT concentration (dissolved in PBS and filtered through a 0.2 μm filter before use to remove any blue formazan product) is added immediately after diluting the cells, which are then incubated for 3.5 hours at 37 °C. The resulting blue formazan product is solubilized overnight (16 hours) at 37 °C by the addition of 500 μL of 10% sodium dodecyl sulfate　(SDS) in 0.01 M HCl to each well. A sample (150　μL)　from each duplicate well is transferred to a 96-well　microplate, and the optical density determinedby automated spectrophotometry against a reagent blank (no　cells). Absorbance is measured at a test wavelength of 570 nm and a reference wavelength of 690 nm. For each primary cell culture, results from three to six wells from each treatment are averaged, and data are expressed as absorbance 570 to 690 nm. Animal Models: MTLn3 cells are injected into the right fourth mammary fat pad from the head of female severe-combined immunodeficient/NCr mice. Formulation: PIK-75 is dissolved in DMSO and then diluted in PBS. Zheng Z, et al. Mol Pharmacol. 2011, 80(4), 657-664. Moir LM, et al. J Pharmacol Exp Ther. 2011, 337(2), 557-566. Jude JA, et al. Am J Respir Cell Mol Biol. 2012. doi:10.1165/rcmb.2012-0025OC. Smirnova T, et al. Oncogene. 2012, 31(6), 706-715. Smith GC, et al. Biochem J. 2012, 442(1), 161-169.